September 19, 2012, Woodstock, IL - Newer Technology, Inc. (NewerTech®) http://www.newertech.com, a leading developer of Macintosh®, PC, iPod®, iPhone®, and iPad® performance upgrades and accessories, announced today that its Power2U™ AC/USB Wall Outlet won a 2012 People's Choice Stevie® Award in the Favorite Consumer Electronics Product category at the 2012 American Business AwardsSM awards ceremony held September 17 in San Francisco. After debuting at the 2012 Consumer Electronics Show as the industry's first UL Listed in-wall AC/USB charging solution, the Power2U has earned top reviews and wide, cross-industry acclaim for providing a modern, centralized location for charging/powering up to four Apple iDevices, Android devices, and other USB chargeable devices simultaneously. More than 98,000 votes were cast in 30 product categories for this year's People's Choice Awards for Favorite New Products. Consumer online voting began in July, where the Power2U took an early lead, ultimately garnering top honors. Representatives from winning firms were presented with the coveted crystal People's Choice Stevie Award at this past Tuesday's ceremony. Past winners of the People's Choice Stevie Awards for Favorite New Products include Apple, Boost Mobile, and Samsung. 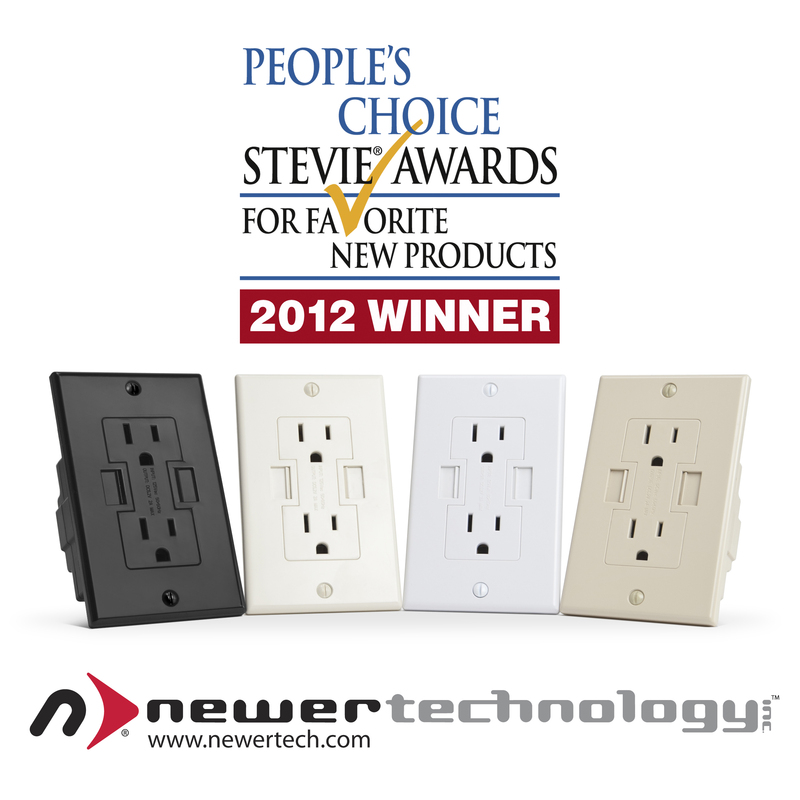 "We are thrilled the Power2U was the overwhelming consumer choice in the Consumer Electronics category," said Grant Dahlke, Brand Manager, Newer Technology, Inc. "The Power2U is an innovative DIY solution for adding convenient, energy-efficient in-wall USB device charging and the People's Choice Award reflects its unique mass consumer appeal." "The People's Choice Stevie Awards for Favorite New Products have become one of the most popular features of The American Business Awards because they complement the peer-review process of our awards competition with another means of validation for product concepts and performance," said Michael Gallagher, president and founder of the Stevie Awards. The American Business Award program, created in 2002 and nicknamed "The Stevies", is the only business awards program in the United States that honors and generates public recognition of corporate and executive achievements worldwide. The Stevie Award trophy is often called "the business Oscar", because it is hand-cast and finished in 24-karat gold by the same company that creates the Oscar. The name "Stevie" is taken from the name Stephen, derived from Greek term for "crowned". Past American Business Award winners have include Apple, Oracle, Hilton Hotels, and AT&T. Praised and Proven by Independent Reviewers The Power2U has captured broad praise from highly diverse independent product review sources. Good Morning America called it 'brilliant'; the Miami Herald named it 'gadget of the year'; and its easy, under 20 minutes installation time was confirmed by Tech Tilt and Two Shots of Geek. There's the practical side of Power2U use as well. Well Connected Mom said, "I love it... you can plug in your phone and your tablet along with your toaster oven and coffee maker or electric shaver and electric toothbrush." Since 1984, Newer Technology, Inc. (NewerTech) has been recognized as the leading developer of performance upgrades and accessories for Macintosh and PC computers, iPods, iPhones, and iPads. NewerTech is headquartered in Woodstock, Illinois. Dealer inquiries are welcome by calling 815-308-7001 or by emailing sales@newertech.com. CustomRetailer, a publication of the Consumer Technology Publishing Group, is a business strategy magazine for the residential A/V and automation integration electronics professional, featuring information from respected professionals about new technologies and applications. Departments and features are focused on training, employee retention, business management, marketing and merchandising from respected experts in their fields. NewerTech and the NewerTech arrow logo are trademarks of New Concepts Development Corporation, registered in U.S. Patent and Trademark Office. Power2U is a trademark of Newer Technology, Inc. registered in U.S. Patent and Trademark Office.